When Was Christ Crucified and Resurrected? Here is the only sign Jesus gave to prove He was the Messiah. Do you know how important the details surrounding the death, burial and resurrection of Jesus Christ are to you and to this world? If you call yourself a Christian, you certainly must believe Jesus is the Son of God, but have you ever studied the only proof Jesus ever gave of that fact? Have you ever carefully evaluated what Jesus said, what actually took place and how it compares to the teachings of your church? “Then certain of the scribes and of the Pharisees answered, saying, Master, we would see a sign from thee. But he answered and said unto them, An evil and adulterous generation seeketh after a sign; and there shall no sign be given to it, but the sign of the prophet Jonas: For as Jonas was three days and three nights in the whale’s belly; so shall the Son of man be three days and three nights in the heart of the earth” (Matthew 12:38-40). Jesus was constantly being challenged by the religious leaders of His time. In this instance, some Pharisees asked for a sign that He was the Son of God. Understanding the events surrounding the death, burial and resurrection of Jesus Christ is critical to being a true Christian. Isn’t it time you proved your own beliefs? Several important aspects of Matthew 12:38-40 should be honestly evaluated. The first and perhaps most crucial is contained in verse 40, where Jesus clearly and specifically stated that He would be buried for three days and three nights. Is that what your church teaches? Or have you been taught the fable about a Friday crucifixion and Sunday morning resurrection? Try counting the number of nights and days for yourself. From Friday until Sunday morning, you will only find two nights and one day, not three of each. Jesus said He would be in the earth for three days and three nights as proof He is the Son of God. If the teaching of most “Christian” churches is true, Jesus was only in the earth for two nights and one day, which would mean Jesus is not proved to be the Son of God. So, now what do you do? How can you call Jesus the Son of God if His own words disprove it? How has the Friday to Sunday myth come to be taught and believed so universally? First, religious leaders point to the fact that Jesus was crucified the day before a sabbath day. Then they wrongly conclude it means He was killed on a Friday, since the Bible calls Saturday the Sabbath. (As an aside, this proves that those same religious leaders know Saturday is the biblical Sabbath we are commanded to keep holy in the Fourth Commandment. For more on this topic, request our free booklet Which Day Is the Christian Sabbath?) They overlook the fact that it was actually an annual sabbath, as we will see. Second, it was prophesied that there would be false teachings that would sway or be accepted by “many” (e.g. Matthew 24:4-5, 11). Satan, who has worked at deceiving mankind for 6,000 years (Revelation 12:9), is the one behind this deception. These religious leaders who claim that Jesus was killed Friday afternoon and resurrected Sunday morning, totaling one day and two nights in the tomb, are—by denying the only sign Jesus gave of His Messiahship—actually denying Christ. Your Bible proves that the murder of Jesus occurred on Wednesday, April 25, in the year a.d. 31—not Friday. It also proves that the resurrection of Jesus occurred at sunset on Saturday evening, April 28, not at sunrise on Sunday. Let us look closely at what really happened when Jesus was killed. “After two days was the feast of the passover, and of unleavened bread: and the chief priests and the scribes sought how they might take him by craft, and put him to death” (Mark 14:1). “And the first day of unleavened bread, when they killed the passover, his disciples said unto him, Where wilt thou that we go and prepare that thou mayest eat the passover?” (Mark 14:12). Jesus was having His disciples prepare for the passover, which is not a holy day, but is a sacred service. “And he said unto them, With desire I have desired to eat this passover with you before I suffer” (Luke 22:15). This is the event commonly called the Last Supper; however, in reality it is the “Lord’s Passover” (Exodus 12:11, 27; Leviticus 23:5). It is not the Passover of the Jews, as so many churches teach today. Continue reading through Mark 14, and the events and timing become clear. It is also recorded beginning in Matthew 26, Luke 22 and John 18. Jesus and His disciples partook of the Passover in the evening, then went to the garden where Jesus prayed. In the night, Jesus was taken prisoner by a band of men from the chief priests and Pharisees. “And they led Jesus away to the high priest: and with him were assembled all the chief priests and the elders and the scribes” (Mark 14:53). This was in the night, following the Passover. Immediately the next morning, Jesus was taken to Pilate. “And straightway in the morning the chief priests held a consultation with the elders and scribes and the whole council, and bound Jesus, and carried him away, and delivered him to Pilate” (Mark 15:1). After the charade that passed for a trial, Jesus was sentenced to be killed. “And they bring him unto the place Golgotha …. And when they had crucified him, they parted his garments, casting lots upon them, what every man should take. And it was the third hour, and they crucified him” (Mark 15:22, 24-25). Time was measured according to the military watches, or guards. The third hour was 9 a.m. in our modern terms. “And when the sixth hour [noon] was come, there was darkness over the whole land until the ninth hour. And at the ninth hour [3 p.m.] Jesus cried with a loud voice …. And Jesus cried with a loud voice, and gave up the ghost” (verses 33-34, 37). Jesus died at 3 p.m. the day before the first day of Unleavened Bread referred to in Mark 14:1. The day before a holy day is called a day of preparation. This was such a day. The first day of Unleavened Bread is an annual sabbath, or a holy day. Next was the burial of Jesus by Joseph. Luke 23:50-55 describe Jesus’s burial and clearly state that Jesus died and was buried on a preparation day, the day before a sabbath day also called a high day (John 19:31). The phrase “the sabbath drew on” shows it was getting very near sunset—when days start and end according to biblical reckoning. Look closely at the next event in the book of Mark. “And when the sabbath was past, Mary Magdalene, and Mary the mother of James, and Salome, had bought sweet spices, that they might come and anoint him” (Mark 16:1). The word had was added by the translators. So Mark 16:1 states the women bought spices after the sabbath and Luke 23:56 says they then rested on the Sabbath after they bought spices. There is only one explanation that fits both scriptures: After buying the spices, the ladies prepared them for use on the body of Jesus. Then they rested on the weekly Sabbath (Exodus 20:8-11; see also Exodus 23:12; 31:15). John states the sabbath after Jesus was buried was the high sabbath of the first day of Unleavened Bread: “The Jews therefore, because it was the preparation, that the bodies should not remain upon the cross on the sabbath day, (for that sabbath day was an high day,) besought Pilate that their legs might be broken, and that they might be taken away” (John 19:31). A high day is an annual sabbath, not the weekly seventh-day Sabbath. So the Bible is clear that there were two sabbath days the week Jesus was crucified, but it takes some detective work to discover it. Begin by reading The New Englishman’s Greek Concordance and Lexicon, by Wigram-Green. Look up the Greek word numbered by Strong’s as 4521 and translated as “sabbath” in Matthew 28:1 (King James Version). This publication uses a “note” to delineate whether the word is singular or plural in its original form. There are several plural forms indicated by the note; however, pay particular attention to Matthew 28:1; Mark 16:2; John 20:1, 19. Each of those usages is a plural form of the word sabbath; each should have been translated “sabbaths.” To verify this, check each of these verses in The Holy Bible in Modern English by Ferrar Fenton. You will find that each uses the plural word “sabbaths” rather than the mistranslation in the singular. By leaving off the “s” to reflect the plural of the word sabbath, a very subtle deception is started. The order of events during that terrible and great week of Christ’s murder is clear. Only one explanation fits all the verses perfectly, and there are no contradictions in the Word of God. Follow the only timeline that fits every verse surrounding these events and coordinates with the three-days-three-nights prophecy of Christ. On a Tuesday evening, after sunset, Jesus and His disciples kept the Passover. Afterward they went to the garden, and Jesus was captured. Wednesday morning, He was brought before Pilate and sentenced to death. He was crucified at 9 a.m., and Wednesday afternoon at 3 p.m., Jesus died. Joseph begged the body from Pilate very near sunset. Wednesday evening, Jesus was buried. Thursday was a high day, or annual sabbath, the first day of Unleavened Bread, and they ceased from work. Friday was the weekly preparation day, and the women bought and prepared spices and ointment to properly complete the burial of Jesus. Saturday, they rested on the weekly Sabbath. Sunday morning, near sunrise, the ladies came to the tomb to find that Jesus was already risen. Using elementary math, we can count the following: Wednesday, Thursday and Friday night total three nights. The days of Thursday, Friday and Saturday total three days. The holy days actually lined up to these dates in a.d. 31. The first day of Unleavened Bread fell on Thursday, April 26. That meant Wednesday was the preparation day for the high sabbath. After the high day came Friday, April 27—the preparation day for the weekly Sabbath, when the ladies prepared the spices. Saturday was the weekly Sabbath and Sunday was the first day of the next week, when the ladies came to the tomb early in the morning. Jesus was in fact killed on Wednesday, buried near sunset Wednesday evening and remained in the tomb until near sunset Saturday evening. Any other count disqualifies the only sign Jesus gave verifying that He is the Son of God and the Savior of mankind. Someone may ask about the testimony of the angel at the tomb on Sunday morning (e.g., Luke 24:1-6). 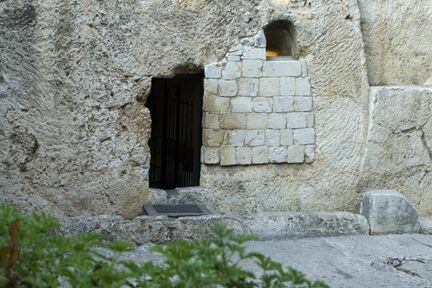 Each reference simply states that Jesus was not there: He “is risen,” as Luke stated it. Of course He was not there—He had been resurrected at sunset the evening before. Again, with a little detective work anyone can discover the meaning of the original Greek words, and none of them suggests in any way that Jesus was in the act of rising at that time. Another person may ask whether Mark 16:9 states that Jesus arose on the first day of the week. It says Jesus appeared to Mary, not that He was rising. There is simply no verse anywhere in the Bible to support a Friday crucifixion or a Sunday resurrection. God’s Word proves beyond question the Messiahship of Jesus Christ. All the verses surrounding His death and resurrection are perfectly coordinated, without contradiction. You can read it clearly in your own Bible: Jesus was in the grave three days and three nights, from sunset on Wednesday until sunset on Saturday, when He was resurrected. He is the Christ; He is our Savior, the Son of the living God.